Sign up for the MNB Wake Up Call! This commentary is available as both text and video; enjoy both or either ... they are similar, but not exactly the same. To see past FaceTime commentaries, go to the MNB Channel on YouTube. Hi, Kevin Coupe here, and this is FaceTime with the Content Guy. The Times makes the point that the situation has economic implications - history and English classes are cheaper to teach than, say, engineering or computer sciences, but the university charges the same for both. Plus, a lot of the kids who arrive at the university have already taken advance placement courses for college credit, which means that they may not have to spend as much time and money in college as they might’ve in another time. I was chatting with Michael Sansolo about this the other day, and he remembered a story from the Milwaukee Journal Sentinel from a few months ago saying that the University of Wisconsin-Stevens Point was “headed toward phasing out 13 low-demand humanities majors to reduce its nearly $8 million structural deficit.” Majors like history will be, well, history. Now, I’m no academic … just a sort of dilettante lucky enough to be an adjunct faculty member at Portland State University in Oregon. But I have to say I agree with the idea that college students who don’t learn about literature and history aren’t really getting an education. You can learn a lot about how to think and analyze by studying history. You can learn a lot about how to express yourself through literature. I’d feel a lot better about the world if more scientists and lawyers and doctors had read more Shakespeare and Fitzgerald and maybe some Toni Morrison and Margaret Atwood and even some Hemingway. I’ve done some informal lobbying at Portland State to teach a class that would be a requirement for business majors that would teach them how to read and write effectively … but not business writing. I think the same kind of course could be taught to STEM students … they all might not see the relevance to their jobs and careers and paychecks, but it would be good for their minds and souls, and that’s what college ought to be about, too. ”He hath disgraced me and hindered me half a million, laughed at my losses, mocked at my gains, scorned my nation, thwarted my bargains, cooled my friends, heated mine enemies—and what’s his reason? That’s what I call an education. It is what is on my mind this morning, and as always, I want to hear what is on your mind. I think most of us have been heartened by the degree to which a wide variety of companies have stepped up to show compassion, flexibility and generosity in the face of the partial government shutdown that now is in its second month, with little evidence that it will end anytime soon. But I did love this one … in part because it showed innovative thinking by a start-up company that we’ve mentioned here on MNB. 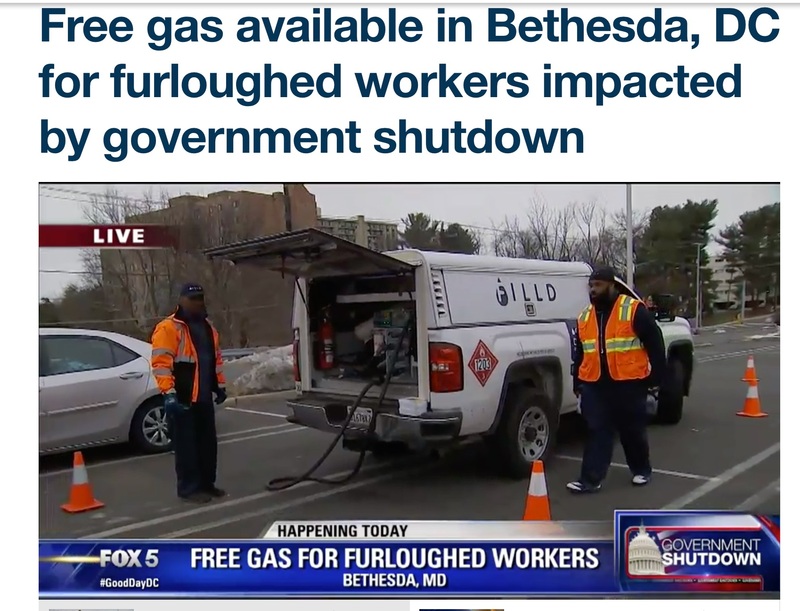 Now, Fox News reports that Filld went to the Washington, DC, area recently to offer 10 gallons of free gasoline to people who could show a government ID. There were some limits - each Filld truck only carries 400 gallons of fuel - but the move did a couple of smart things. It helped people who are often in dire need of assistance - if they’re trying to make a decision between paying their mortgage or rent and feeding their families, 10 gallons of gas is a big deal. And, it created visibility for a retail offering with which many locals may not be familiar … and that can only help Filld over the long term. Smart move, and my idea of an Eye-Opener. Bloomberg reports that Amazon is testing an autonomous delivery robot, called ‘Amazon Scout,’ in the Seattle suburbs. The Scout is said to be the size of a cooler and able to to navigate around people and pets; it will make deliveries during daylight hours, Monday through Friday. There will be six Scouts deployed in the test. Perhaps more important than the specific test itself is the fact that this is just the company’s “latest experiment to automate the last-mile of delivery that’s a labor-intensive and costly component of buying products online,” as well as just one of a series of tests of delivery robots taking place around the country by different companies. KC's View: In the broader sense, this has to be seen as Amazon’s latest foray into the delivery world, testing new technologies that could help it compete more effectively with the likes of the US Postal Service (USPS), FedEX, and United Parcel Service (UPS). This is all of a piece - Amazon testing the limits of what it can and should do as part of its ecosystem-centric approach to business. I’m sure there are a bunch of folks out there who will shake their heads and think that Amazon is biting off more than it can legitimately chew. But this is a company that generally tends to live up to its ambitions, and when you think of some of the other things that founder/CEO Jeff Bezos is involved with, using robots to deliver packages or mail doesn’t even seem so tough. When you think that way, so much of the other stuff - you know, the Earth-bound stuff that actually pays the bills - must seem relatively easy. KC's View: This won’t be an easy sell. People dubious about the impact of switching from single-use disposable bags to a more sustainable version may not see getting their shampoo bottles and deodorant containers refilled as wildly attractive options. But .,.. it seems to me that this is an initiative that - even though it will take a long time to get the kind of scale that will allow it to break even, much less see any sort of profitability - could point the way to a different approach to waste, which most people would agree has become an growing problem affecting our fragile planet. That’s great … but as I read the Journal story, it seems to me that there are a couple of other things going on here. First, there is the fact that if reusable containers are being refilled on a regular basis, it means that the companies have achieved some level of automatic replenishment of their own brands. It is some equivalent of Amazon’s Subscribe & Save, which locks participants into a never-ending replenishment cycle for consumables that they use regularly … which is extraordinarily powerful for both Amazon and the growing list of participating brands. At the same time, the program as described also seems to offer manufacturers the potential ability to disenfranchise the retailers that traditionally have sold their products. If P&G and Unilever are showing up at a shopper’s home to refill these items, that means the shopper isn’t going to the store to buy them. This would strike me as something retailers ought to be concerned about. This tells me a few things. One, while the program may be tested in New York and Paris, the fact that TerraCycle is negotiating with retailers in all those places suggests that it already has plans to expand the test. And, it tells me that if this initiative takes off, the retailers that are part of it will have an advantage over those that do not … if for no other reason than it creates an ecosystem in which the store becomes more relevant to the brands’ value proposition and customers’ declared priorities. Newsweek has a story in which it seeks to recognize companies that it says provide some of the best customer service in the country - customer service that, for the sake of this analysis, is provided by real people. While “those meaningful roles are imperiled by the forces disrupting virtually every workplace in America,” Newsweek writes that “as we examined the larger, impersonal forces that are transforming retail, it seemed like a good time to recognize a more personal factor in business success: the ways in which many companies nurture their relationships with consumers." The supermarkets that get the highest marks in the Newsweek study: Publix, ShopRite, and Trader Joe’s. The superstores and warehouse stores: Costco, Meijer and Target. The convenience stores: QuikTrip, Wawa and Sheetz. She was playing my song. The Newsweek story simply reinforces something that Michael Sansolo and I have been talking and writing about for years - great people can be the ultimate differential advantage. Smart retailers know that, and treat them like assets. Other retailers don’t get it, and treat their people like costs and liabilities. Those other retailers may not be around that much longer, because they’re not giving people a reason to go to their stores at a time when bricks-and-mortar stores are increasingly threatened by their own irrelevance and the disruptive forces that surround them. The discussion of “toxic masculinity” - or more accurately, the ad campaign launched by Gillette to address the issue, and the blowback against the company that came from various quarters - has not been entirely welcomed by everybody in the MNB community. Some have said they are glad to see the conversation here and elsewhere, and agreed with my supportive commentary. Some said they would prefer companies simply make and sell products, and not get involved in such issues because nobody cares what they think. A few have argued that they don’t want to see stories about the issue on MNB, and have no interest in my opinion. Everybody has a right to their opinions, certainly … and I’m doing my best to be a fair curator of various positions while being transparent about my own opinions (since that is, after all, sort of what I do here). I feel strongly that this is not gratuitous … this is a legitimate business story. If everybody has a right to their opinions, that includes the folks at “Saturday Night Live,” where they produced a gently mocking video about persistent “toxic behavior” by a well-known commercial icon. I thought it was pretty funny … and worth posting here. Bloomberg reports that McDonald’s Corp. is feuding with many of its franchisees over a wall. The wall is one that the company wants its franchisees to build, separating the customer counter and the kitchen, believing that it will “hide unsightly kitchen equipment” and improve the chain’s image. KC's View: Longtime MNB readers know that I’m not the biggest McDonald’s fan … but I actually think that its relatively open kitchens are a positive at a time when we see too many stories about employees behaving badly (and sometimes disgustingly) at fast food restaurants. I like transparency. Maybe McDonald’s ought to treat visible kitchens as a positive asset, not something to be hidden. "It’s a bad time to be in the business of selling groceries, and the headlines are as bleak as you’d expect: "The Retail Apocalypse Is Coming for Grocery Stores" ... "Grocery Retail ‘Bloodbath’ Is Here" ... Conversely, it is a great time — arguably the best time ever — to buy groceries." We think it is a great time to be selling groceries, whether you are a retailer or a supplier. That’s because a more educated and demanding consumer, no matter the demographic, will reward businesses that are innovative, disruptive, and in touch with what people need, even if they don’t know they need it. And, we know this: Those businesses require, and are fueled by, great people. People who don’t just get the job done, but who set the tone in an organization, establish cultural and business priorities, who build teams, and who are able to not just adapt to competitive realities, but see the future and thrive in it. And yes, ignore dire warnings about a "retail apocalypse" and see opportunities. At Samuel J. Associates, we have a winning record of connecting great talent and innovative businesses ... as well as innovative talent with great businesses. We exceed your expectations so that you can do the same thing for your customers. • The Associated Press reports that the Virginia State Senate has unanimously passed a bill “that would establish the Virginia Grocery Investment Fund to provide $5 million for the construction, rehabilitation and expansion of grocery stores in underserved communities throughout the commonwealth … . The money would be distributed by the state treasurer with approval from the Department of Housing and Community Development. The bill now goes to the House for consideration, though the AP story suggests that its prospects for passage there are not assured. • Massachusetts-based Big Y Foods announced yesterday that its chairman/CEO, Donald H. D’Amour, will move away from his day to day responsibilities, with the CEO role to be taken by his cousin, Charles L. D’Amour, who also will continue as company president. MassLive notes that “Donald D’Amour is the son of Big Y co-founder Paul D’Amour; Charles D’Amour is the son of co-founder Gerald D’Amour." Michael P. D’Amour, has added the role of COO to his responsibilities as executive vice president. Guy W. McFarlane, Big Y’s vice president of fresh foods since 2011, has been promoted to senior vice president of sales and marketing. Richard D. Bossie, Big Y’s vice president of operations since 2016, has been promoted to the new position of senior vice president of operations and customer experience. Nicole D’Amour Schneider, Big Y’s senior director of store operations, has been appointed to the new position of vice president of supermarket operations. A brief and sad note this morning … Jeanne von Zastrow, who worked for the Food Marketing Institute (FMI) from 1986 to 2015, based in Utah and serving not just as the association’s western emissary but also as Senior Director of Sustainability and Industry Relations, reportedly has passed away. She was 63, and had left FMI to launch her own custom hiking and guide service based in Moab. KC's View: I don’t have any more details on this and her obituary has not yet been posted. But I did want to mention this, because Jeanne was the kind of person who always seemed smiling and enthusiastic … there were some years when FMI was not exactly friendly to people like me (it was bad when I was a magazine writer and got worse when I became a “blogger,” a word that someone there once used as an unpleasant epithet), but never Jeanne … I didn’t know her well, but she seemed to have this enormous heart fueled by the outdoors that she clearly loved. This is going to hit a lot of industry people hard. Sad news. Your Views: Where Have You Gone, Joe DiMaggio? Yesterday, MNB took note of the newly announced Baseball Hall of Fame inductees yesterday, and that Mariano Rivera, the career leader in saves, became the first player ever elected unanimously to the Hall. Nobody is going to argue with Mariano Rivera’s career or Hall of Fame credentials. But I must admit that I have a problem that he somehow managed to be the first player ever elected unanimously. Not Ted Williams or Joe DiMaggio. Not Mickey Mantle or Willie Mays or Sandy Koufax. Not Babe Ruth or Lou Gehrig. Not Jackie Robinson. Not Stan Musial. Or any one of dozens of legendary players. Rivera was a great player and competitor - the best closer of all time. From all reports, he is a good man and role model. I’m glad when people like him get recognition, and happy that the Hall of Fame continues to reject players like Barry Bonds and Roger Clemons that have been tainted by the steroids scandal. But the first one to be elected unanimously? Hard to accept that one. Spoken like a true Mets fan. Maybe. But I totally respect Rivera … even though he was a Yankee. Isn’t it more a statement on what must’ve been some awfully curmudgeonly writers in the past? Maybe. Though it isn’t my impression that modern baseball writers are a gentle, accommodating bunch. Not only did the HOF voters not elect Joe DiMaggio unanimously, I’m pretty sure that they did not elect him in his first year of eligibility. These folks with HOF votes (writers and members?) are fickle, to say the least. Now, if I understand it right, the delay had more to do with a change in eligibility requirements (it went from a one-year wait to a five-year wait, though DiMaggio was exempted) and timing issues that had a number of great players lined up ahead of him. Still, it is remarkable that he had to wait. I love the fact that I got so much email about this (MNB readers are terrific! ), and that I learned something I didn’t know before (which happens every day). In this fast-paced, interactive and provocative presentation, MNB's Kevin Coupe challenges audiences to see the fast-evolving retail world through a radical new technological, demographic, competitive and cultural prism. These issues all combine to create an environment in which traditional thinking, fundamental execution, and just-good-enough strategies and tactics likely pave the path to irrelevance; Coupe lays out a road map for the future that focuses on differential advantages and disruptive mindsets, using real-world examples that can be adopted and executed by enterprising and innovative leaders. Want to make your next event unique, engaging and entertaining? Contact Kevin at kc@morningnewsbeat.com , or call him now at 203-253-0291. In this special Retail Tomorrow podcast, recorded at Google’s New York City offices during the recent National Retail Federation (NRF) Show, we convene a panel of experts from a wide range of fields to open our eyes to the possibilities. This Retail Tomorrow podcast is sponsored by the Global Market Development Center (GMDC). • Lee Peterson, EVP of Thought Leadership at WD Partners. • Ben Conwell, Senior Managing Director & National Practice Leader of the E-commerce Fulfillment Group at Cushman Wakefield. • Jeff Baskin, EVP, Global Partnerships at Radius Networks. • Dror Cohen, Chief Of Staff of Waze Ads at Waze. • Chris Lydle, Retail innovation Lead for Google.